WHO: Noodles & Company (Nebraska Dining Franchise Group), serving classic noodle and pasta dishes from around the world, announced that all six of its restaurants in Nebraska will host an all-day fundraiser on April 8 to support Nebraska flood relief, in partnership with the American Red Cross of Nebraska and Southwest Iowa, a community-based humanitarian organization that prevents and alleviates human suffering in the face of emergencies by mobilizing the power of volunteers and the generosity of donors. 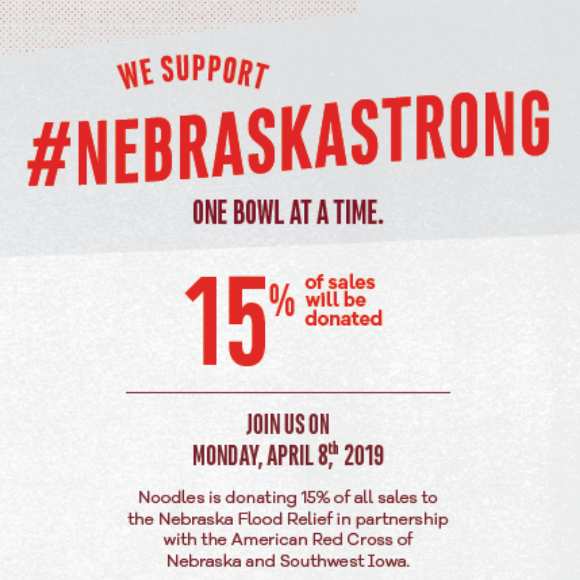 WHAT: Noodles & Company will donate 15 percent of sales generated at Nebraska restaurants. WHEN: Monday, April 8, 2019 from open to close.